Brokers, would you like to feel more confident about giving COBRA advice? Click on any of the following free COBRA reports to instantly download the COBRA information you need to answer COBRA questions and stand out as a trusted partner. Does COBRA administration have you confused? Need COBRA info? This informative report helps you make important decisions regarding your role as a broker. 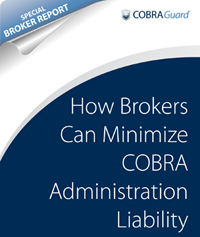 Keep clear of COBRA administration chaos and get your COBRA communication on track with our free report "How Brokers Can Minimize COBRA Administration Liability." Want to gain hero status by offering COBRA? This free report contains great COBRA info about the best candidates for COBRA outsourcing and how to offer COBRA administration services. Don't let other brokers get all the glory. 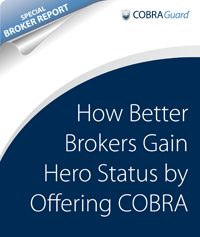 Download our free report "How Better Brokers Gain Hero Status by Offering COBRA." An ounce of preparation can save a pound of headaches when it comes to COBRA. Download this revealing free report "How to Prepare Employers for COBRA Housekeeping After Open Enrollment" and find out why auditing carrier invoices and taking a close look at COBRA administration is vital after open enrollment. Wonder what happens to COBRA when a client goes out of business? Download our free report "What to Do About COBRA When a Client Goes Out of Business." Learn the Stop, Drop and Roll formula for COBRA when a client closes its doors. Be informed, aware and ready to jump into action with COBRA help during this most stressful time. Wondering if COBRA administration services will still be needed with Healthcare Reform? You're not alone! Download our free report "Offering COBRA in the Age of Health Reform." This informative report addresses common misconceptions about COBRA and Healthcare Reform.